Right from LKG, she has been wearing a very thick powerful glasses. As she grew up, this Madurai girl began missing several things in life because of her poor eyesight. Ridiculed by friends and relatives, the young school-going child and her parents faced mental trauma and feared that the future looked bleak for her education, marriage and job. 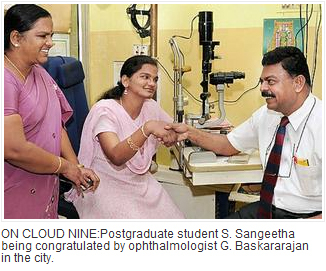 But, destiny saw this sports-loving postgraduate student, S. Sangeetha (22), with a different eye and this Madurai girl had won the battle for vision and now she need not wear 'soda bottle' glasses anymore thanks to a successful surgery performed last month by city ophthalmologist, G. Baskararajan, who restored her eyesight to normalcy from an almost hopeless condition. What are eye tumours ? 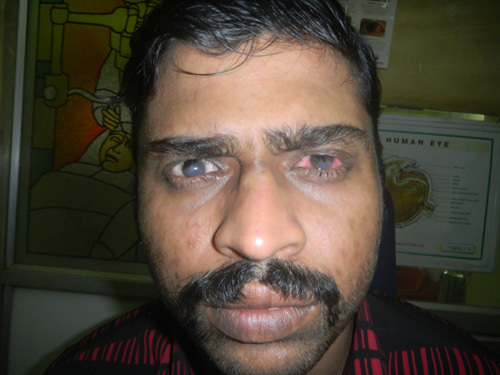 Dry Eye Syndrome (also known as Keratoconjunctivitis Sicca) is one of the common problems seen among individuals. It is a kind of eye disease caused due to dryness in the eyes as a result of decreased tear production or increased tear film evaporation.It is said that dry eye syndrome is one of the most common eye disease seen among more that 5% population in the world. Tamil Nadu's oldest city and one of India's oldest cities, with a history which can be boasted back to the Sangam period of the Pre-Christian era.